This time we have found you the means to visit the amazing capital of China for less: a cheap flight from Chicago to Beijing. 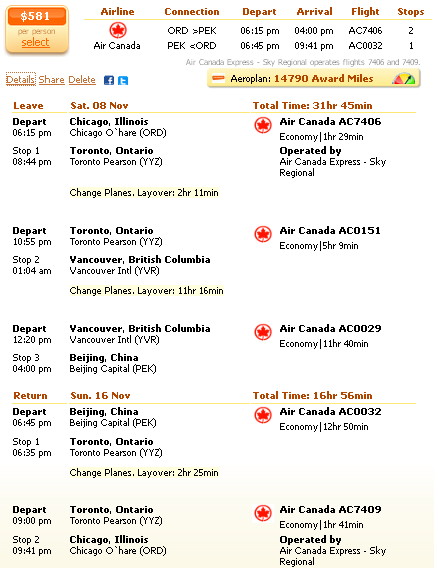 Book now and fly with Air Canada in mid November to save over $200 on your ticket compared to the other airlines we have checked.We have found the Beijing flight deal featured in this post on Travelgrove. Start your search there, but also check some of the other sites from the box so you can compare their prices for similar deals and make sure that you are purchasing the cheapest flight. The China flight we have found departs from Chicago O’Hare International Airport (ORD) on November 8 and returns on November 16 from Beijing Capital International Airport (PEK). On the way to Beijing there is one 2 hour 11 minutes stop in Toronto and a 11 hours 16 minutes one in Vancouver. On the way back there is only one stop in Toronto for 2 hours 25 minutes. The Aeroplan frequent flyer program will give you 14,790 award miles if you book a flight with Air Canada. Book Air Canada’s flight got $581 and save at least $236 compared to the next cheapest airfare, a multiple airlines flight operated by Hainan Airlines and Alaska Airlines as you can see below. One Way Flights to Canada from $119* on Air Canada! This entry was posted on Tuesday, September 30th, 2014 at 12:42 am and is filed under Airfare Deals. You can follow any responses to this entry through the RSS 2.0 feed. You can leave a response, or trackback from your own site.